Sunday 22nd July 2012. Very probably the greatest ever day in British Cycling history. It was a real pleasure to mark this occasion by performing the most simple of tasks, riding our bikes. 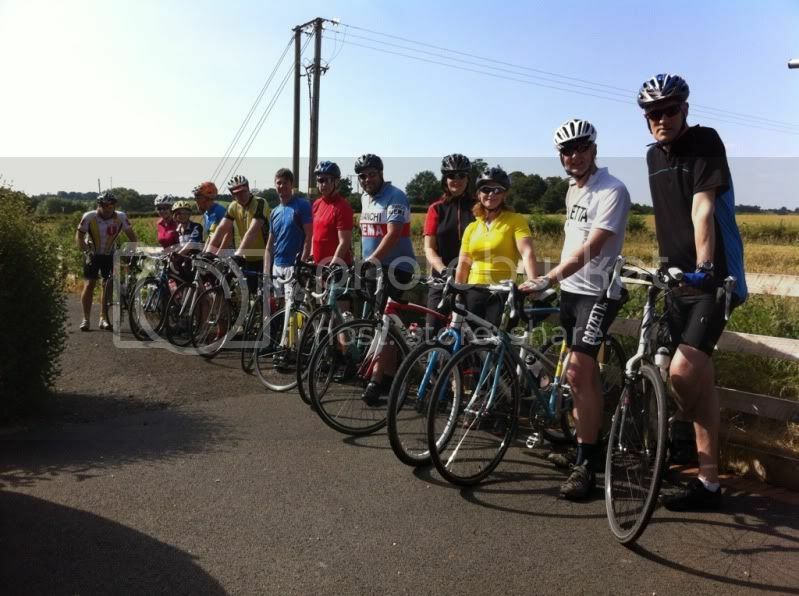 When I’d originally organised this ride, I had no idea it would give us the opportunity to celebrate the first ever British winner of the Grande Boucle, our very own Bradley Wiggins. After weeks of terrible weather even the sun came out to mark the occasion. After the obligatory introductions, and last minute faffage, we were rolling away from our Shifnal base, at a few minutes past 10. The route was planned to have us back in time to catch the finish on the Champs Elysees. As we escaped from the clutches of Shifnal and over the border into Staffordshire(dangerous I know), it was clear just how the events in France had captured the nation’s imagination. I don’t think I’ve ever seen so many cyclists out. We must have seen literally hundreds of other cyclists as we meandered through the lanes, all paying their own personal tributes to Wiggins, Cavendish et al. The sun continued to shine, and the kilometres were passing quickly. Picturesque village after picturesque village passed by and as we reached the 50km mark it was time for a well earned beer in The Dartmouth Arms, Burnhill Green. After a quite lovely wonderful of Enville it was time to get back on the bikes and head for home. In no time at all we were coming back into Shifnal, and the pace suddenly lifted. Park Street may not be the Champs Elysees, and the Railway Bridge is a poor substitute for the Arc de Triomphe, but you have to play the hand your dealt. I could hear Scott approaching quickly on Max, and so it was time to wind up for the final sprint. In fairness I managed to sneak a few metres head start, but it’s always nice to roll by the finish line(Shifnal Dental Practise) at the head of the Pack. After further re-hydration at HQ, it was time to head home to watch the final few kilometres of the tour. It certainly didn’t disappoint and we were treated to the vaguely surreal sight of seeing the Maillot Jaune leading out the Rainbow Jersey for a fourth straight win on the perhaps the famous boulevard on the planet. Chapeau! What a fantastic end to a fantastic tour. Our ride wasn’t too bad either. Thanks to all those who attended, and I hope everyone enjoyed it. I’ll try and sort out something similar in September/October.